An increasingly vast and interconnected web of interdependence makes it impossible for any one person to know everything. Of the data we use today, 90 percent was created in the last two years, according to Inga Beale, Lloyd’s Chief Executive Officer. But even as humanity grapples with 21st century realities and change tsunamis are unleashed at an accelerated rate, our civilization has yet to learn to collaborate in a meaningful way. Despite advanced technologies, I have observed the world’s default cultural mode is still very much “For me” maximization. 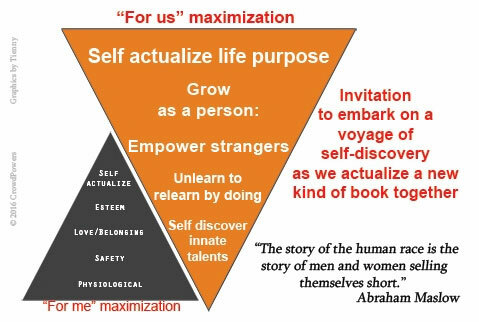 Until we can collectively succeed in making the titanic mindset shift to abundance/ “For us” maximization —whatever strategies anyone comes up with may fall apart too easily or benefit only a few as they will be more of the same. Most people are too overwhelmed by immediate concerns to think out of their box, caught up in traditional, linear and non-disruptive thinking to be able to grasp systemic challenges or simply lack opportunities to participate as a way to self-discover their innate gifts. Startups are all the rage now but while it is easy to startup, globally—most startups/businesses fail. The real challenge is sustainability and very often, they are human challenges. Generally, tremendous economic pressures (KPIs) also force decision makers to decide against sustainability. If that’s not systemic failure, what is? So, late last year, to try to help people understand systemic changes, I set out to write a book about business NOT as usual, with a focus on root causes for some of the biggest challenges we face this century. More a social experiment than a book, it is a tool to create opportunities for people to experience a new way of thinking, doing and sharing. To enable building trust for our shared future, the focus will be on self-discoveries and relationship building (See https://www.crowdpowers.com/how) instead of pure transactions. As we openly go from “For me” (scarcity mindset) to “For us” (abundance mindset) maximization, elements will emerge as you self-discover your strengths, learn about current realities from one another and empower each other. Since we really are much more than money making machines, I believe sharing benefits (including finances) with fellow co-creators should be central to our shared future. With this experiment, net book revenue will be equally shared with all key drivers as an example of “For us” maximization. But whether that is eventually actualized/published will depend on the crowd. It is only with your participation that this “For us” maximization movement can take off. Can strangers (regardless of location, race, gender, age, language or religion) set aside egos to empower one another to be the best we can be for everyone’s benefit? Initially, that can be as simple as (liking and) sharing this link on your social media pages while you decide how else you may wish to participate. Everyone can do something but nobody can do everything. Yep, this is a social experiment to find out if strangers anywhere can build trust with each other. There is NO business plan.